When I first heard this song I immediately thought it was Bobby Bland, which is funny because he was actually the first person to record and release this song, but the version I was listening to was actually the first official cover performed by Little Milton. Better known as Little Milton, James Milton Campbell Jr was a blues singer and guitarist who started making music at the age of just 12 when he performed regularly as a street musician. Heavily influenced by T-Bone Walker and the sounds of blues and rock’n’roll, Little Milton was in his first band whilst still only a teenager and it was at this point that he got his first record deal! In 1952, whilst out playing with his band, he caught the attention of Ike Turner, who at the time was a talent scout for Sam Phillips at sun Records. He signed a contract with the label and recorded a number of singles, but none of these made airplay and (subsequently) poor record sales were a reflection of this; by 1955 he had left the Sun Records. After several failed attempts so secure a position with another record company Milton set up his St. Louis-based Bobbin Records label and it was through this that he scored a distribution deal with Leonard Chess of Chess Records! It was at this point that Milton also began to produce records, helping artists such as Albert King and Fontella Bass rise to fame, whilst also experiencing his own success for the first time! After a number of small format and regional hits, his 1962 single, So Mean to Me, broke onto the Billboard R&B chart, eventually peaking at #14. 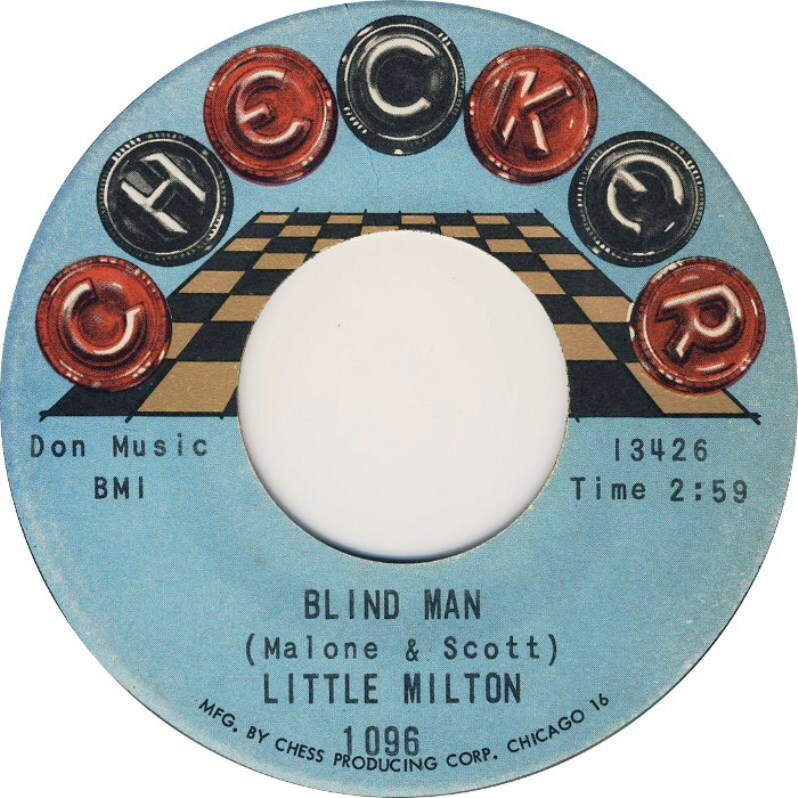 His next release brings you to today’s song, Blind Man, which Little Milton released as a single in the December of 1964, just 10 months after Bobby Bland released the original (which you can listen to below). Both Bland’s and Milton’s versions are great, but it was Little Milton that introduced me to this track and I am rather fond of his powerful rendition so check it out above! This entry was posted in Blues, cover version, Funk, Soul and tagged Blues, cover version, Funk, Soul. Bookmark the permalink.